LENR News and Research - Key Distinction: Why LENRs Are Not "Cold Fusion"
The idea of "cold fusion," to put it bluntly, is nonsense. Low-energy nuclear reactions, however, which do not assert a fusion mechanism but instead rely principally on so-called weak interactions, are real science, supported by excellent experimental data and the viable Widom-Larsen ultra-low momentum neutron theory. My distinctions between and definitions of the two concepts were adopted by the Library of Congress in 2016 and my 2016 books were the first books published in the United States with the Library of Congress authoritative subject heading for LENR. The following chronology explains the ebb and flow of the conceptual recognition of this new science. In 1989, Fleischmann and Pons didn't know what they had stumbled on. Nobody knew. Their best guess was that it was fusion, but they didn't have enough information. 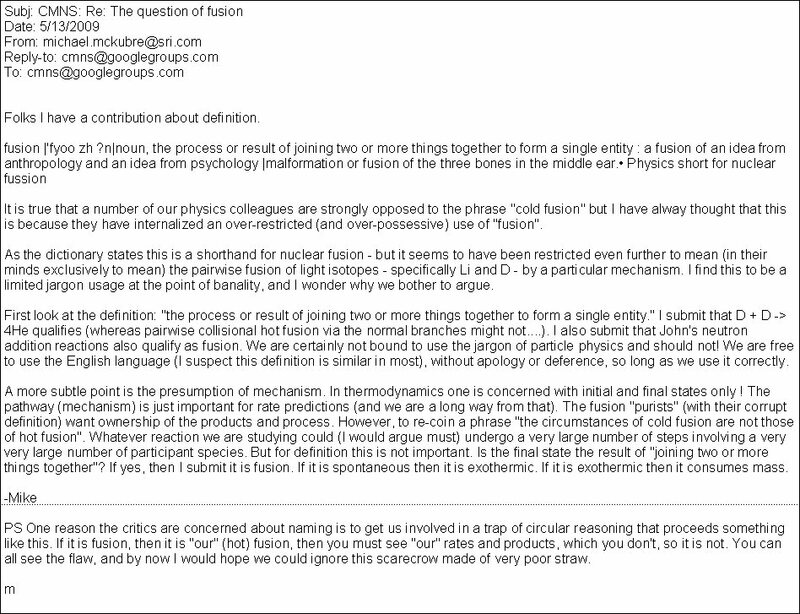 Days before the University of Utah press conference, Fleischmann knew it didn't look like fusion. By 1994, Peter Hagelstein, one of the most well-known "cold fusion" theorists, and an associate professor of electrical engineering at MIT, recognized that fusion was an unlikely theoretical explanation for LENR phenomena (see below). Instead, he speculated neutrons likely were the key. 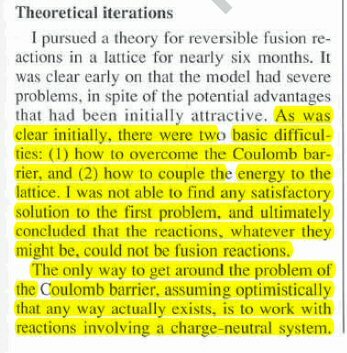 By 1996, Michael McKubre, an electrochemist at SRI International, also recognized that LENRs did not look like fusion (see records below). At this time in cold fusion history, and going back to 1989, some LENR researchers proposed that LENRs were the result of weak interactions and neutron capture processes. 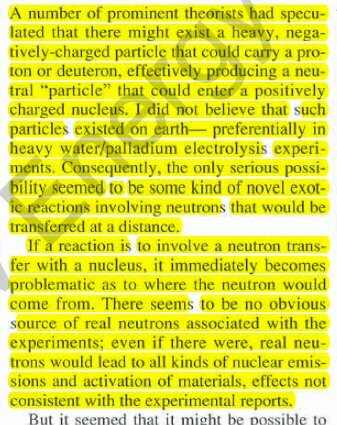 But nobody, including Hagelstein, was able to a) figure out how real neutrons could be created in LENR systems and b) how the neutrons could have such low energy that they were not detected outside the experiments. Likewise, nobody had figured out why, if real nuclear reactions were occuring, gamma rays were not seen outside the experiments. In 1996, Hagelstein abandoned his effort to figure out a neutron-based theory. 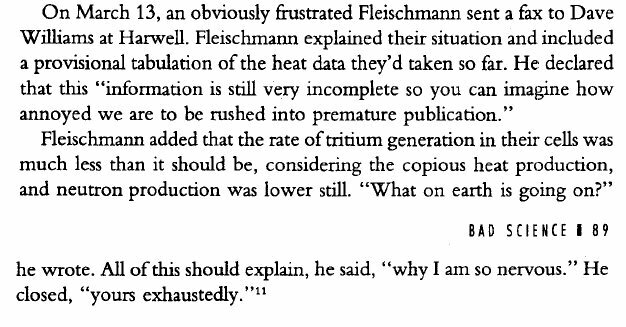 By 2000, Hagelstein and McKubre shifted their perspective 180 degrees and went back to the idea of "cold fusion." The basis for their new opinion was their reinterpretation of a 1994 SRI International experiment called "M4." For the next decade, Hagelstein and McKubre led the field internationally, as well as the public, to believe that "cold fusion" was real and that they had found the proof. They even tried, in 2004, to convince the Department of Energy to believe them and fund their research. 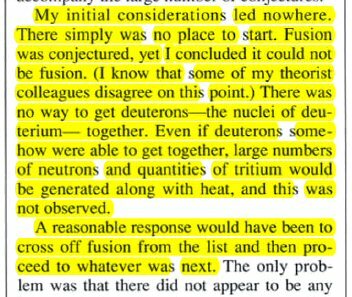 Hagelstein and McKubre stated that "cold fusion" was explained by the room temperature nuclear fusion of deuterium and that the primary product of this reaction was helium-4, expressed as D + D --> 4He +24 MeV (heat). 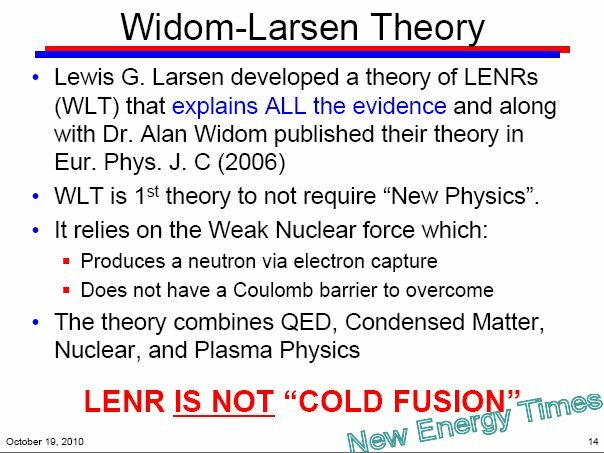 But the next year, in 2005, Lewis Larsen and Allan Widom published a preprint of their theory that explained LENR, but not as "cold fusion." They were the first theorists to publish a viable theoretical explanation, using conventional physics, that showed how LENRs were feasible using weak interactions to create real neutrons, followed by neutron capture processes. At the end of their paper, after displaying several proposed reaction chains, they wrote 'The above examples show that final products such as helium-4 do not necessarily constitute evidence for the direct fusion D + D --> 4He." Immediately following the release of Widom and Larsen's preprint , most the researchers in the field, who were aligned with the D + D --> 4He +24 MeV (heat)" concept, responded to Widom and Larsen with contempt; their theory was heresy. On Aug. 20, 2008, at the American Chemical Society national meeting, Steven B. Krivit stated that LENRs did not look like "cold fusion." He reviewed the differences between the products of thermonuclear fusion and the products of LENRs. During the question and answer session at the end, no "cold fusion" researchers presented any corrections or arguments with Krivit's analysis. However, by May 2009, several outspoken "cold fusion" scientists were actively attempting to convince their peers and the public to redefine fusion so that their new definition better matched the products of LENRs. On an Internet discussion list, McKubre encouraged the "cold fusion" researchers and fans on the list to support his contribution of a new definition of fusion. On the same discusion list, Nobel prize-winner Brian Josephson attempted to get people to agree with his perspective. "I hope people will agree with me that blandly coming out with the statements such as 'fusion is not involved' should be considered bad practice," Josephson wrote. "Many of the experimentalists assume or speculate that the causative nuclear events are fusion processes, though in many, if not all, cases, the evidence for fusion is far removed from and poorly matches that which is well-understood as the recognized phenomena of thermonuclear fusion. Some LENR researchers interpret their solitary findings of 2.5 MeV neutrons or 3.0 MeV protons as unambiguous proof of deuterium-deuterium fusion. Evidence the findings may be; proof they are not." In January 2010, while Krivit was reviewing a manuscript for the Wiley Encyclopedia of Nuclear Energy, he began asking questions of the author, a LENR researcher working for the U.S. Navy. The researcher had included the D + D --> 4He +24 MeV (heat) in the manuscript and stated that the 2000 McKubre and Hagelstein paper constituted proof for D + D --> 4He +24 MeV (heat). As Krivit fact-checked the references for the "proof," he found significant problems with the reference given by the Nayv researcher. After several weeks of investigation, Krivit found that McKubre had gradually changed, added and deleted data points and values in his experiment "M4" that he and other researchers had claimed for the previous decade to be the "proof" of "cold fusion." Most of the researchers in the field at the time were aligned with the D + D --> 4He +24 MeV (heat)" concept. Krivit, who had written The Rebirth of Cold Fusion in 2004 with Nadine Winocur, was now a heretic. In January, a few cold fusion researchers who had political influence within the field, took a strong position against Krivit. They collaborated with Marwan and withdrew Krivit's forthcoming presentation for the LENR session at the March ACS meeting without Krivit's consent or awareness. On March 20, 2010, Krivit, published his full apostasy, "Reality of LENR and the Mythology of Cold Fusion." He also published, on New Energy Times, the presentation he had prepared for the American Chemical Society meeting, and in it, the technical distinctions between "cold fusion" and LENR. 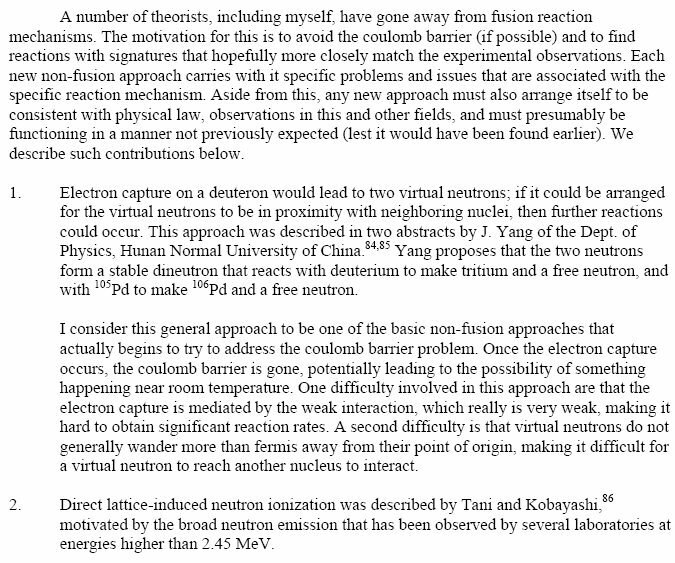 On July 30, 2010, Krivit published "Cold Fusion is Neither." In this Special Report, Krivit showed how a few cold fusion researchers who had political influence within the field had ignored and attempted to suppress conflicting data, transmutations and isotopic shifts, with the idea of "cold fusion." On Oct. 19, 2010, NASA reseacher Joseph Zawodny was the first person to follow Krivit and state that "LENR is not 'Cold Fusion'."